Tomas Alfredson, known for the Swedish vampire film “Let The Right One In” directs this sinister, espionage packed, film adaptation of John le Carre’s novel, “Tinker, Tailor, Soldier, Spy”, which found such critical acclaim as a TV drama starring Alec Guinness in 1979. The film features the cream of British acting talent including Gary Oldman, Colin Firth and Tom Hardy, Oldman taking some persuading to step into the shoes of his hero, Alec Guinness. Alberto Iglesias composed the score to the film; he has also been nominated for an Academy Award for his work in the film “The Constant Gardener” (2005) and again for his work in “The Kite Runner” (2007). Tomas Alfredson’s meaty distillation of John le Carré’s novel is superbly accentuated by Alberto Iglesias’ elegiac, string-driven score. The jazz-inflected motif for George Smiley is infused with melancholic trumpet and understated piano, while Karla possesses an ebb and flow of harp, and Jim Prideaux a mournful display of violins. Iglesias plies an effective strain of muted romance in Tarr and Irina with its measured piano and violins, while the title track is a gripping soundscape of isolation and paranoia, in true le Carré fashion. 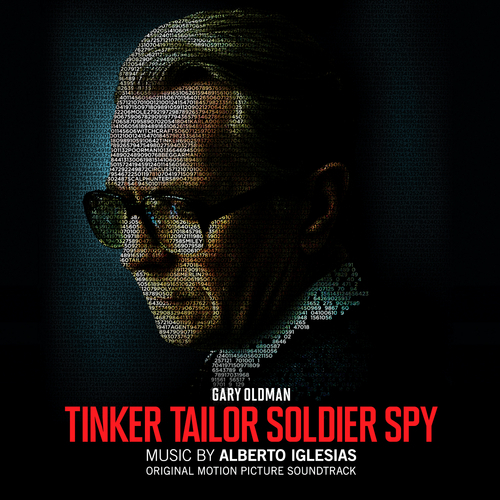 With his score to the much anticipated film version of John Le Carre’s spy novel, Alberto Iglesias’s Tinker Tailor Soldier Spy recalls Geoffrey Burgon’s elegiac music to the landmark 1979 BBC TV series and reimagines the noirish conventions of spy film scoring. With its unresolved themes and dynamic instrumentation, his elegant musical tapestry of subtle rhythms and exquisite colours (notably solo piano and clarinet) goes beyond traditional character and thematic scoring approaches to create a pervasive and haunting atmosphere of menace and paranoia. The Spanish composer ( Che, The Constant Gardener, The Kite Runner ) delicately weaves sinuous melodic lines and pulsing electronica with spare orchestration to produce an evocative score of surprising drama and suspense. Having previously scored The Constant Gardener, Almodovar favourite Iglesias has no trouble evoking John le Carre’s world again with a jazz-infected soundtrack steeped in mournful horns and strings, with a murky atmosphere. Muted and enigmatic, the 19 cues conjure stealth and unease, only occasionally straying into conventional thriller territory. When they do, though - as in the tense ‘Esterhase’ - you can see Gary Oldman’s hunter circling his quarry. Alberto Iglesias - Anything else?